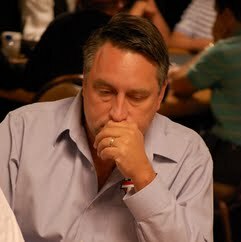 William "Bill" Edler is an American professional poker player from Las Vegas, Nevada. He has a law degree from the University of California, Berkeley. Edler won a World Series of Poker bracelet in 2007 by claiming the $5,000 buy-in shorthanded No-Limit hold'em tournament. The win earned Edler over $900,000. In 2007 Edler cashed in the money for the first time in the $10,000 No Limit Hold'em Main Event Championship coming in 23rd place out of a field of 6,358 players, winning $333,490. Edler has also had success in heads-up playing, winning the inaugural $10,000 buy-in Heads-Up Poker Championship in Compton, California in 2007. In addition, Edler won the September 2007 World Poker Tour title at the Gulf Coast Poker Championship, winning $747,615. At this event he set the record for the greatest come back in World Poker Tour history. With only 17 players left out of 256 entries with only 2 tables left, Edler had only 2 x $1,000 chips left and was unable to meet the blinds of $4,000/$8,000. Edler went on to win the event, making this the biggest comeback in World Poker Tour tournament history.